“I’m very sorry,” was all I could say, feeling very penitent and helpless. “She has Sylvie’s eyes!” I thought to myself, half-doubting whether, even now, I were fairly awake. “And that sweet look of innocent wonder is all Sylvie’s too. But Sylvie hasn’t got that calm resolute mouth nor that far-away look of dreamy sadness, like one that has had some deep sorrow, very long ago—” And the thick-coming fancies almost prevented my hearing the lady’s next words. “If you had had a ‘Shilling Dreadful’ in your hand,” she proceeded, “something about Ghosts or Dynamite or Midnight Murder—one could understand it: those things aren’t worth the shilling, unless they give one a Nightmare. But really—with only a medical treatise, you know—” and she glanced, with a pretty shrug of contempt, at the book over which I had fallen asleep. “You have a real good terrifying Ghost in that book?” I hinted. “How could you guess?” she exclaimed with the most engaging frankness, and placed the volume in my hands. I opened it eagerly, with a not unpleasant thrill like what a good ghost-story gives one) at the ‘uncanny’ coincidence of my having so unexpectedly divined the subject of her studies. “Fayfield Junction, my Lady, change for Elveston!” the guard announced, flinging open the door of the carriage: and we soon found ourselves, with all our portable property around us, on the platform. But the lady scarcely noticed the little incident. 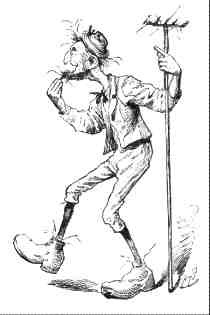 After one glance at the ‘banished man,’ who stood tremulously leaning on his stick, she turned to me. “This is not an American rocking-chair, by any means! Yet may I say,” slightly changing her place, so as to make room for me beside her, “may I say, in Hamlet’s words, ‘Rest, rest—’” she broke off with a silvery laugh. “—perturbed Spirit!”‘ I finished the sentence for her. “Yes, that describes a railway-traveler exactly! 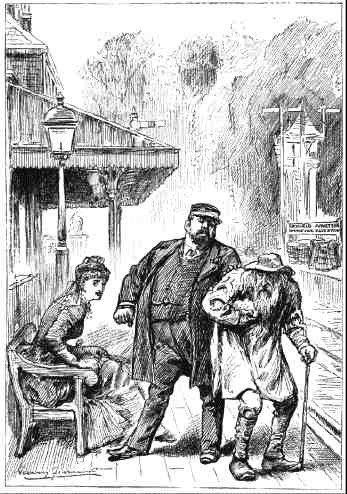 And here is an instance of it,” I added, as the tiny local train drew up alongside the platform, and the porters bustled about, opening carriage-doors—one of them helping the poor old man to hoist himself into a third-class carriage, while another of them obsequiously conducted the lady and myself into a first-class. She paused, before following him, to watch the progress of the other passenger. “Poor old man!” she said. “How weak and ill he looks! It was a shame to let him be turned away like that. I’m very sorry—” At this moment it dawned on me that these words were not addressed to me, but that she was unconsciously thinking aloud. I moved away a few steps, and waited to follow her into the carriage, where I resumed the conversation. “A development worthy of Darwin!”, the lady exclaimed enthusiastically. “Only you reverse his theory. Instead of developing a mouse into an elephant, you would develop an elephant into a mouse!” But here we plunged into a tunnel, and I leaned back and closed my eyes for a moment, trying to recall a few of the incidents of my recent dream. “And who’s that other thing?’, said the Gardener. “Was he your brother yesterday?” the Gardener anxiously enquired. “Course I were!” cried Bruno, who had gradually crept nearer, and didn’t at all like being talked about without having his share in the conversation. “If I was oo,” said Bruno, “I wouldn’t wriggle so early. It’s as bad as being a worm!” he added, in an undertone to Sylvie. “I wonder you’ve the face to tell me such fibs!” cried the Gardener. Sylvie discreetly changed the subject. “And did you plant all these flowers?” she said. “In the winter-nights—” the Gardener was beginning. “It’s as much as my place is worth!’, the Gardener muttered, taking a key from his pocket, and beginning to unlock a door in the garden-wall. “How much are it wurf? “Bruno innocently enquired. But the Gardener only grinned. “That’s a secret!” he said. “Mind you come back quick!” he called after the children, as they passed out into the road. I had just time to follow them, before he shut the door again. The old man snatched it from him, and devoured it greedily, as some hungry wild beast might have done, but never a word of thanks did he give his little benefactor—only growled “More, more!” and glared at the half-frightened children. I lost the rest of the sentence, for my mind had recurred, with a great shock of surprise, to Lady Muriel Orme, who had so lately uttered these very words of Sylvie’s—yes, and in Sylvie’s own voice, and with Sylvie’s gentle pleading eyes! “Follow me!” were the next words I heard, as the old man waved his hand, with a dignified grace that ill suited his ragged dress, over a bush, that stood by the road side, which began instantly to sink into the earth. At another time I might have doubted the evidence of my eyes, or at least have felt some astonishment: but, in this strange scene, my whole being seemed absorbed in strong curiosity as to what would happen next. “We are safe here, my darlings!” said the old man, laying a hand on Sylvie’s shoulder, and bending down to kiss her. Sylvie drew back hastily, with an offended air: but in another moment, with a glad cry of “Why, it’s Father!”, she had run into his arms. “Father! 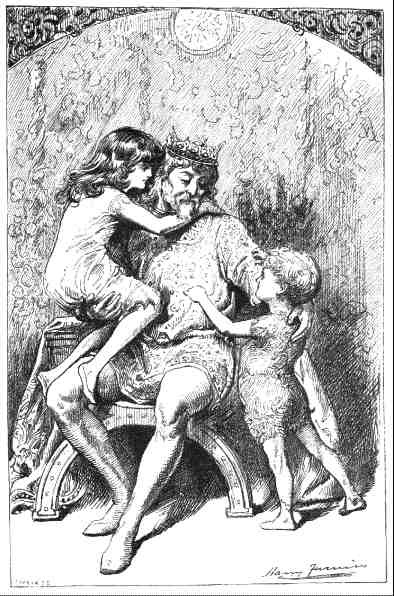 Father!” Bruno repeated: and, while the happy children were being hugged and kissed, I could but rub my eyes and say “Where, then, are the rags gone to?”; for the old man was now dressed in royal robes that glittered with jewels and gold embroidery, and wore a circlet of gold around his head. A Beggar’s Palace last modified March 28th, 2010.